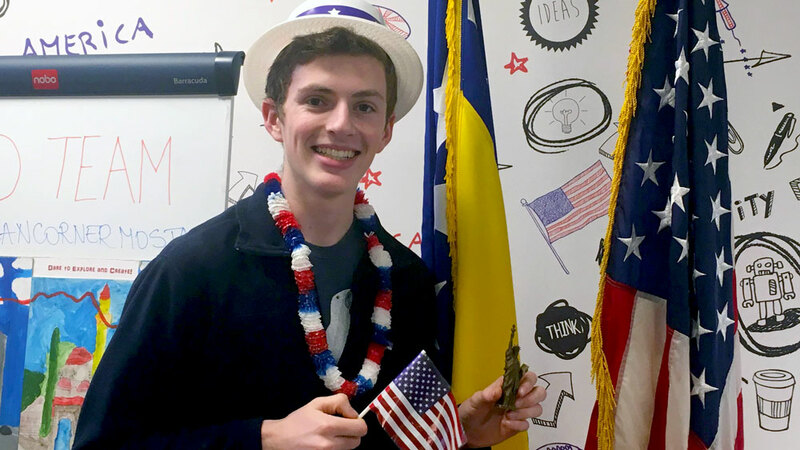 Benjamin Blum, a Kennedy-Lugar Youth Exchange and Study Abroad Program (YES Abroad) participant is the March 2017 American Abroad Student of the Month. Hailing from Marin School of Environmental Leadership at Terra Linda High School in his hometown of San Rafael, California, Ben is currently studying at Druga Gimnazija in Sarajevo, Bosnia Herzegovina. Ben is known by the members of his host community as a hardworking student and active volunteer who continuously seeks out opportunities for cultural exchange. Since starting his program in Sarajevo, Ben has completed 105 hours of volunteer service. He earned many of these hours promoting the YES program and engaging in community service events. He volunteered at the Sarajevo Race for the Cure event in October, the Diplomatic Bazaar in December, and in his host school throughout the year. Almost every Friday Ben teaches conversational English skills to his Bosnian peers from the Catholic School Center in Sarajevo. Ben also volunteers as a social media accounts manager for Project 1948, a Non-Governmental Organization (NGO) that gives cameras to people in Sarajevo to document daily life and social impact projects. Excelling in school, Ben was one of three students selected from his Economics class to participate in a regional economics event in Belgrade, called “International Days.” This event promotes the role students as future leaders can play in creating an economically and a politically stable environment in the Balkans. Ben’s interest in the local culture, history, and way of life of his host country has inspired his end of the year capstone project which explores the reconciliation efforts within Bosnia and Herzegovina and how these efforts have progressed over the past years in regards to interethnic and interreligious understanding. Known for his spirit of service, positive attitude, maturity and great sense of humor, Ben has been a joy to his host family and academic community in Sarajevo and is a a true youth ambassador.